SQL Server needs to make sure data types match when performing operations that involve multiple pieces of data. When the data types do not match, SQL Server has to implicitly convert the data before performing any operations. While most of the time these implicit conversions go unnoticed, they are important to understand since they can lead to unexpected results. To understand why this happens, we need to understand SQL Server’s data type precedence logic. Here we still return the result of 10, however SQL Server had to do a little more work. We know from the previous example that 4.4 on its own is of type numeric, and in this example we are explicitly casting .44 to a float. SQL Server isn’t able to perform the division operation directly on two different data types, so it refers to its data type precedence table to decide which value to convert to a matching datatype. In the linked table above, the float data type appears higher on the list than numeric (synonym: decimal) data type. This causes SQL Server to convert our numeric 4.4 to a float before dividing. While SQL Server is doing extra work behind the scenes that we didn’t explicitly request, we can’t be too angry with it since it still is giving us the “correct” answer. What this really means is that the decimal portion of 4.4 is getting chopped off, leaving us with an equation of 4 / .44 = 11. What exactly is going on here? Well for starters, data type precedence is forcing SQL Server to convert the VARCHAR .44 to a numeric. But a numeric with what precision and scale? While it’s easy to blame SQL Server for not knowing how to perform simple mathematical operations, it’s us the developers who are to blame. SQL Server is a piece of software following rules for how to handle unclear situations that we input into it. Having SQL Server throw an error instead of assuming data types and implicitly converting data on our behalf would make things less ambiguous, but it would also make simple operations a lot more tedious (looking at you SSIS). In reality, the best solution is to accurately define data types from initial creation and to always be explicit with data types when the value of your computations matters. I do my best work in the mornings. Evenings are pretty good too once I get a second wind. Late afternoon are my nemesis for getting any serious technical or creative work done. Usually I reserve that time for responding to emails, writing documentation, and brewing coffee. Some afternoons I can’t help myself though and end up getting myself into trouble. Simplified, but you get the point. Like I mentioned, late afternoons are not when I do my best work. I couldn’t figure out why SQL Server was converting my -30 to January 31, 1900. Intrigued and having no clue what was going on, I decided to post the question with the #sqlhelp hashtag on Twitter. Fortunately for me, Aaron Bertrand, Jason Leiser, and Thomas LaRock all came to the rescue with ideas and answers – thanks guys! In hindsight, the answer is obvious: the -30 implicitly converts to a datetime (the return type of my @Today variable), in this case 30 days after the start of the minimum datetime value, 1900-01-01. This makes perfect sense: SQL Server needs to do some math and in order to do so it first needs to make sure both datatypes in the equation match. 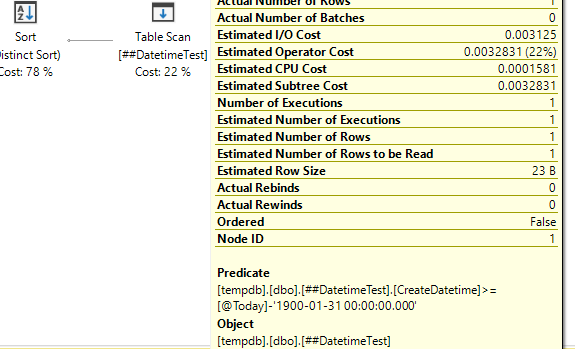 Since int readily converts to datetime but not the other way around, SQL Server was just doing its job. As I mentioned earlier, this int to datetime conversion wasn’t the actual issue with my query – in my drowsy state I mistook it as being the source of my problem. And while it wasn’t a problem this time, it can become a problem in the future. Aaron has an excellent article on the problems with shorthand date math, but the most relevant future issue with my query is: what if someone in the future decides to update all datetimes to datetime2s (datetime2 being Microsoft’s recommended datatype for new work)? AHHH! While SQL Server had no problem converting our previous code between datetime and int, it’s not so happy about converting datetime2. In the end, the above scenario had nothing to do with the actual problem I had on hand (which had to do with some operator precedence confusion).